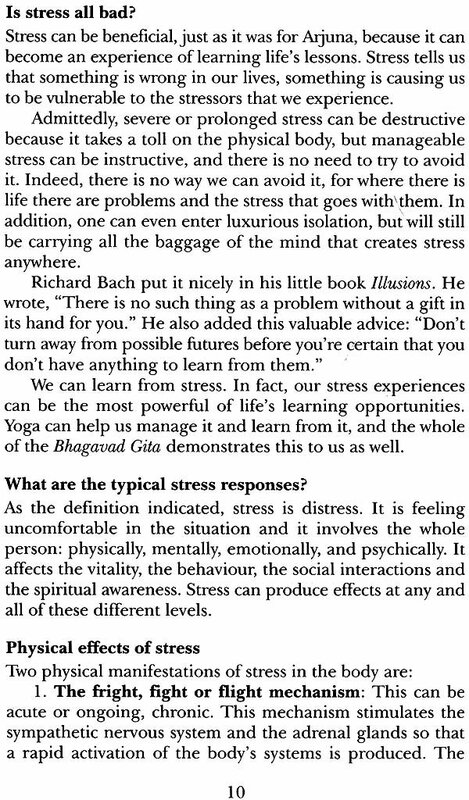 The Bhagavad Gita is one of those unparalleled works in the history of the world that has something for everyone. Any perspective that one wishes to see life from, this book of seven hundred verses written over five thousand years ago, has the answers pertinent to that perspective. Thoughts on the Gita delves into Sri Krishna's discourse to Arjuna from the psychological point of view, to find solutions to the dilemmas and mental struggles one faces in everyday life. The author. Dr Rishi Vivekananda. a practising psychiatrist and yoga teacher for over forty years. uses the wisdom gleaned from his chosen path in life to reveal an insightful understanding of the Gita and its relevance to every individual. 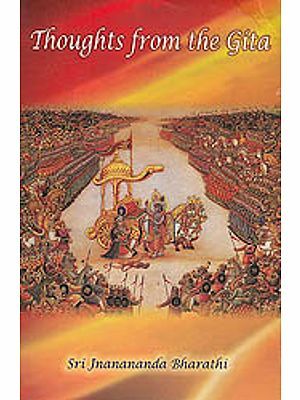 Written in an easy style full of humour, thoughts on the Gita takes one closer to understanding one’s mind and one’s place in the world. Dr Rishi Vivekananda (Dr Brian Thomson, MBBS [Syd], MANZCP, OPM) has been a physician for over 45 years, and a consultant psychiatrist for over 40 years. During most of that time he has explored ways to integrate the techniques of yoga with modern knowledge of the mind, body, and healing. He was initiated into poorna sannyasa by Swami Satyananda in 1976, and from 1977 to 1986 he travelled the world teaching and learning about the synergy between yoga and science. Dr Rishi Vivekananda was initiated into rishi sannyasa by Swami Niranjanananda in 1993 and appointed an ambassador of Satyananda Yoga in 2002. He currently resides at Mangrove Yoga Ashram, Australia. 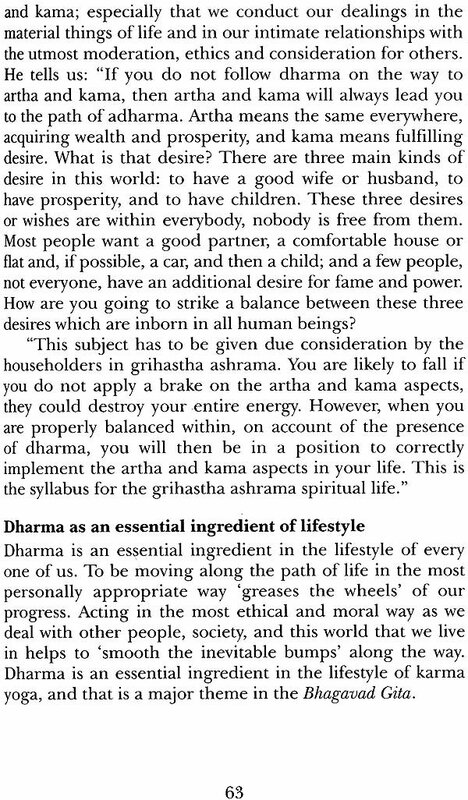 People use the Bhagavad Gita as a handbook of instructions for living. In India, many people worship the book and its principles. Millions of people read it every day, and often try will take just one verse or a small number of verses and to apply it in their interactions over the course of the day. One of the beauties of such multidimensional works as the Bhagavad Gita is that even though there is incredible depth to it, it is still accessible to the ordinary person on the superficial level, and it contains meaningful advice for living one's life. Even the un-initiated will derive great benefit from exposure to it. There are many versions of the Gita in print. 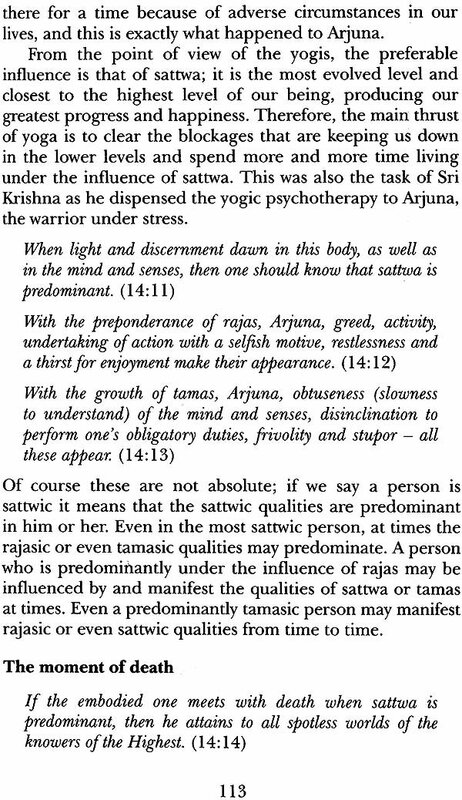 Often there no exact equivalents in English of Sanskrit words, and this .specially true where the meanings can be as deep as they • in the Bhagavad Gita. Thus all sorts of interpretations as the meanings of the individual passages are available, and indeed there is not any agreement as to what the chapter titles should be. Many editions have different chapter headings, and translations can differ widely. The Gita is not just a story. Gita means a song or a poem, and Bhagavad Gita then means 'Song of God'. In its original sanskrit, it is a beautiful piece of poetry with its own rhythm and metre. In the Satyananda ashrams in India, the whole Gita, is chanted by singing the verses to a tune twice a month. However, when it is translated directly into English, the syntax is often cumbersome, sentences are reversed, and meanings can be difficult to understand. So the questions arise, what translation do we use, what commentary do we choose? There are some translations in which modern syntax is used and the English is clear and simple where even gender bias is eliminated, but one wonders if they have perhaps thrown the baby out with the bathwater and lost some of the richness and depth. The version used in this commentary is the Srimad Bhagavad Gita from Gita Press, Gorakhpur, which is the version used in the Bihar School of Yoga and other Satyananda Yoga centres in India, and is the version from which most of the translated verses were taken. Other versions used here are the Bhagavad Gita by Swami Sivananda, Divine Life Society, The Holy Geeta by Swami Chinmayananda, Chinmaya Mission, the Bhagavad Gita by Ramananda Prasad, International Gita Society, the Abbreviated Version of the Bhagavad Gita by Harry Bhalla, International Gita Society, and lectures by Swami Niranjanananda, Peethadheesh of the Bihar School of Yoga, India. The Bhagavad Gita, which forms a part the great epic Mahabharata, consists of a dialogue between the great warrior prince Arjuna and his friend and charioteer Sri Krishna, although Sri Krishna is also presented as an incarnation of the Supreme Being. He was certainly considered that way by the person or people who put the Gita together, as demonstrated by the fact that the Gita has, in many places, Sri Krishna using the word 'I' when he is referring to God. The Bhagavad Gita consists of seven hundred verses divided into eighteen chapters. Throughout the Gita there is much repetition, and as we are dealing with it in its entirety, we will need to omit the repetition. Of course if we were examining only a few verses at a time each day, as many people do, the repetitions would become necessary to regularly remind the readers of the most important principles. It is these principles that we will emphasize here, and rather than providing a commentary on each chapter, this small book deals with the life lessons contained in the Gita one chapter at a time. The dialogue takes place on Kurukshetra, the field of battle. The armies on each side represent two sides of the same royal family, the Pandavas, to which Arjuna belongs, and their cousins the Kauravas. On the other side of the battlefield Arjuna sees many of his family, teachers, friends and others who have been close to him in the past, and it is now his job to kill them. He seriously contemplates throwing down his arms and allowing himself to be killed by the enemy rather than kill all those people who have been so dear to him in the past. However, Sri Krishna reminds Arjuna of his true duty, and this is the main theme of the Gita. Sri Krishna insists that he must perform his duty by fighting the war, with the mindset of doing it simply for the sake of the duty, with faith in God, and with equanimity in success or defeat, gain or loss. Swami Sivananda has said that the whole world is a battlefield. The real Kurukshetra, the true battlefield, is within each of us, and the Mahabharata war is raging there. We haven't yet delved into the story of the Gita, but an introduction to the symbolism in the Gita is relevent here. King Dhritarashtra, the father of the main combatants of the Kauravas, is blind. His blindness is symbolic of his ignorance and our own ignorance, as well. Arjuna symbolizes the individual soul within each of us, and Sri Krishna is the spiritual aspect of the soul, our spiritual essence. The chariot symbolizes the human body, while the five horses are the senses which have to be controlled as the charioteer controls the chariot. Swami Sivananda has said, "The enemies are the mind, the ego and the senses", and this is mentioned often in the Gita. If we are to evolve to our highest potential, we must observe, realize and manage our samskaras and vasanas. Samskaras are the deep mental impressions from our past experiences that remain embedded in our memories. 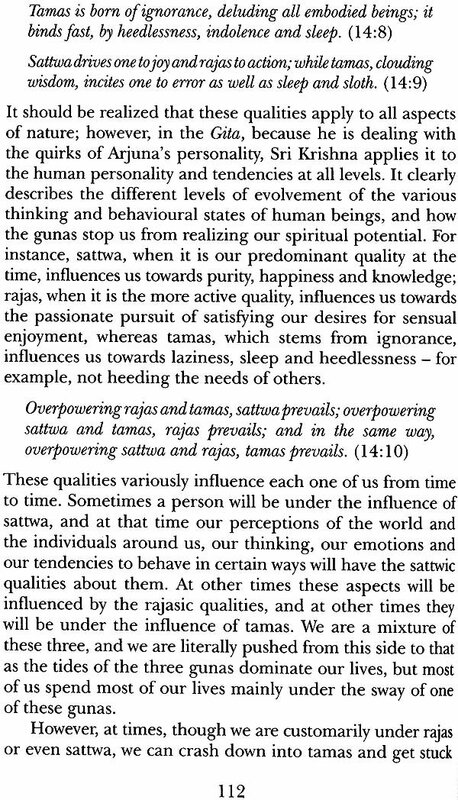 These samskaras propel our vasanas, the latent tendencies and desires, which cause us to act in the same way, time and time again. It is our samskaras, our raga and dwesha or likes and dislikes, and the cravings that result from them that drag m down into such negative expressions as greed, lust, anger, conceit, jealousy and hypocrisy. The Gita begins with a simple but practical question that Arjuna asks of himself: 'Should I fight in this war?' and then the story develops far beyond that. Arjuna wants to throwaway his bow and arrows and go to live as a beggar Sri Krishna tells him it would be wrong for him to do that. Arjuna asks Sri Krishna what he should do, thereby acknowledging that Sri Krishna is his guru. This question gives Sri Krishna the opportunity to present a very large amount of spiritual information and down-to-earth practical advice about the best way for Arjuna and the rest of us human beings to live our lives. One of the great merits of the Gita is that it integrate: different points of view. Around the time that the Gita was: written, the bhaktas were convinced that bhakti is the only way to realize our spiritual essence, thus telling everyone else that they were going in the wrong direction. The jnanis: stated that the only way to God is through divine wisdom and realization. The karma yogis believed that the only way to God is through selfless service in the world, and the raja yogis perceived meditation as the only path. The Gita brought all these perspectives together as an integrated way of living life through the four paths defined by the classical sanatana dharma tradition: the paths of devotion knowledge, action and meditation. Sanatana dharma is the traditional philosophical and social belief system of India. It has sometimes been called Hinduism; however, it is not really a formal religion in the sense that the West knows it. The word 'Hindu' was coined by the British when they lived in India, and it has more to do with the Indus River than with sanatana dharma.